When my neighbor’s oldest daughter turned 18 and graduated from high school, she decided to move out and move in with her boyfriend. Her parents were so mad and disappointed that she was abandoning plans for college and later marriage. They took away the car they had provided her to drive telling her that if she was going to be stupid, she would have to be stupid using her own money and car. “You know, when a girl reach the age of 18 / Lord, she begin to think she’s grown / You know that’s the kind of woman / You can’t never find at home” are the lyrics to which I could immediately relate in this CD’s opening number, “Early In the Morning” by Sonny Boy Williamson. “Enjoying through relating” is a theme for this album. Listeners can relate to the acoustic roots music and instruments as played by the blues’ earliest purveyors. They can relate to the well known artists and songs, like “Smokestack Lightning” by Howlin’ Wolf, “Easy Baby” by Magic Sam Maghett, and “My Baby Left Me” by Arthur “Big Boy” Crudup. Beyond the trip down memory lane, there are five entertaining original songs, and the treatments of the classics feature enough original contributions to make them much more than copycats of the originals. An example of this refreshing updating of a classic is found on “Smokestack Lightning” with Boyes and Brill trading taunting vocals and DelGrosso adding deft mandolin. 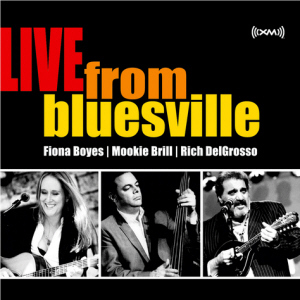 Australian Fiona Boyes, Tom “Mookie” Brill, and Rich DelGrosso, at the urging of Steve Clarke and Bill Wax, Program Director for XM Satellite Radio’s ‘Bluesville” program in Washington DC, entered the XM studios in August 2007. With mutual musical respect from an earlier session on Beale St. in Memphis during the May 2007 Blues Music Awards, a growing friendship, but completely lacking in formal rehearsal or actual combined performance history, they had made rough plans about what they would play on the drive across the Appalachian Mountains from West Virginia to DC. Four hours later they emerged with this album. There are no overdubs, multiple sessions, or takes. It is a true “Live” recording, not formally rehearsed, and with a song list determined by their inspirations at the time. Boyes plays guitar and sings on seven tracks including her clever original numbers, “Homegrown Sin,” “Good Lord Made You So,” and “Two Legged Dog.” Mookie Brill slaps doghouse bass, plays killer harmonica on track 1, and sings on three numbers. For newcomers, this CD could serve as an introduction to the earliest forms of recorded blues without all the tinny weaknesses inherent in those old 78s. For the experienced fans, this CD is as comfortable as an old pair of moccasins. It is not designed to rock your house party, but it is guaranteed to move your soul.